At a time when China’s economic presence is growing in Europe, roughly half of young Europeans (a median of 52%) ages 18 to 33 have a positive view of the People’s Republic. But that view is tempered by their opinions about China when it comes to human rights. However, young Europeans are quite critical of Beijing’s human rights record. A median of just 17% across the seven countries surveyed believe that China respects the personal freedoms of its people. This includes just 6% of German and 7% of Italian Millennials. 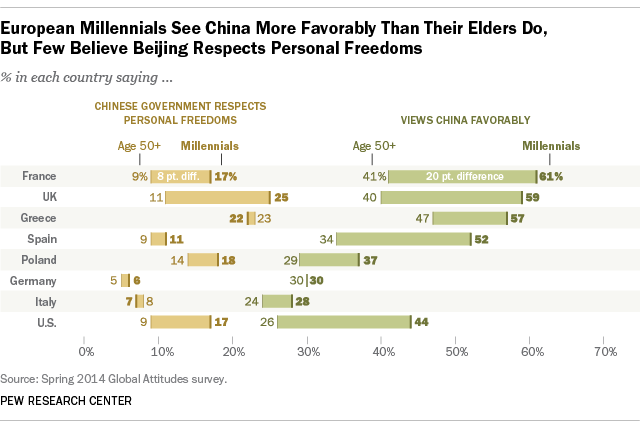 Notably, however, 25% of the British ages 18 to 33 say China respects civil liberties, in contrast with just 11% of British ages 50 and older who agree. While Chinese foreign investment in Europe exceeded a record $18 billion in 2014, according to the Rhodium Group, European Millennials are not yet convinced of China’s economic dominance. Less than half the young public in six of the seven surveyed European Union nations voiced the view that China is now the world’s leading economic power. There is also a wide disparity of opinion on this question between European Millennials: 50% of young British see China as number one economically, but only 32% of young Poles agree. (By comparison, 45% of American Millennials say China is the global economic leader.) There is, however, not much of a generation gap on this issue in Europe, except in France and Poland. French Millennials (41%), for example, are far less likely than their elders (56%) to see China as the world’s economic leader. Nevertheless, young Europeans are convinced that China has replaced or will one day replace the U.S. as the world’s economic and strategic super power. Nearly eight-in-ten Spanish Millennials (79%) and roughly two-thirds of French (67%) and British (65%) young people see China in that future role. Half or more of Europeans born after 1980 in all seven countries surveyed also say that China has already supplanted the U.S. or will eventually. This perspective is much stronger among young people, compared with the views of their elders, in Spain (a 17 percentage point generation gap) and Italy (14 points).